I play a lot of board games and one of my favourite genres is the 'dudes on a map area conquest' game. 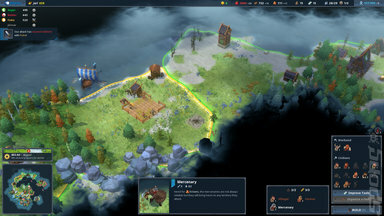 As the rise of board games becomes ever prevalent computer games are taking a lot of cues from them and Northgard is no exception to this, with its reliance on having players conquer areas by sending out explorers that allow them to expand. This feels very akin to games like Clash of Cultures and Eclipse, where players lay down tiles to build the play area as they explore into neighbouring territories. Northgard is a Scandinavian inspired god-sim game that has the player guide a tribe of Viking-like folk in a mystical realm where the Nordic gods are real and can bestow powers onto their worshippers. Like all god-sims, it starts off very small with the tribe having a single town hall and a few houses. Soon a forge, barracks and granary are constructed and a thriving infrastructure is kicking in as the player decides whether or not to expand or to exploit the land they currently occupy. The concept of risk is a core component of Northgard and one that again borrows from the realm of board games. There are seasons that are played through. Winters can be particularly harsh in the north and the player must do everything they can to prepare for them. This means working people harder than they would like in order to avert disaster during the long nights of winter, for it is indeed always coming. But what does this have to do with board games? Well, Northgard consists of a series of turns and as they are expended time marches on. On a certain turn, usually during the winter, a special event happens that is normally pretty negative. This is highlighted on a turn track that is constantly on display and is something players need to minimise the impact of at all costs. This is very similar to round markers in a game like Agricola where players must feed their simulated medieval farmers and their families at pre-defined points in the game. But it's not just tribe vs. winter that the player must contend with. There are also other tribes in the area that are vying for the same sparse resources as the player's tribe is. Relations are typically strained with these neighbours, who are trying to gain the most fame and honour to become the dominant tribe in the north-lands. 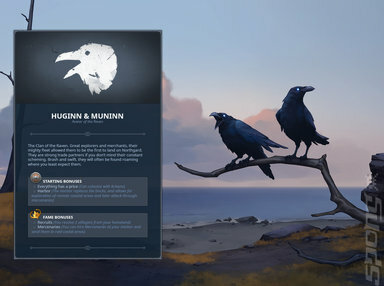 The player must use both diplomacy and force to exert their ascendancy over the other tribes and it is here the most complex aspect of Northgard comes in. Trying to fend off the ravages of a poor harvest while fending off assaults from other tribes is no easy task and it is up to the player to determine what is the most important for the overall health of the tribe. 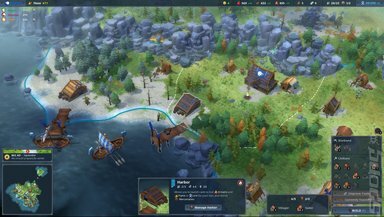 I enjoyed my time with Northgard and I came away impressed. It reminded me a great deal of the earlier versions of Settlers, which is a very old god-sim game that first appeared on the Amiga in the early 1990s. It too had tribes and buildings to erect, but wasn't nearly as polished or enjoyable as Northgard thanks to the 25 years of developments in game design since then. Northgard is out on early access on Windows PC with full release expected later this year.